Overview: Sucrafor, a COSUMAR Groupe sugar beet processing plant in north east (Oriental) of Morocco, North Africa, designed a wastewater treatment plant to maintain high organic loads through anaerobic, anoxic, and aerated lagoons; as they crush more than 5,000 tons of sugar beets daily. Due to the high organic loads and tightening BOD/COD standards, Aeration Industries International’s Aire-O2 Tritons® were installed in 2013. Challenge: The plant operates for 90 days during beet processing and the aeration equipment is required to be fully functional and efficient after downtime during the growing season. Sucrafor was challenged to meet stringent BOD/COD standards and provide a mechanically sound, reliable solution. Solution: Sludge was an area of concern from the previously installed equipment. Aeration Industries helped solve sludge issues through effectively keeping solids in suspension in the aeration basins. Aeration Industries provided twenty 20hp/15kW Aire-O2 Tritons. The equipment was specially designed with anti-erosion baffles to start at a water level of 1.35m/4.43 feet as the processing comes online, and fills to a max level of 3m/9.84 feet water depth. The stainless components were built to withstand the corrosive environment, allowing for no reduction in aeration efficiency. Results: After three years since the installation, the results have positioned the mill to produce more sugar and the plant is able to take on extra load. The BOD loads have been reduced by 99% and COD levels are now well below the required standards. 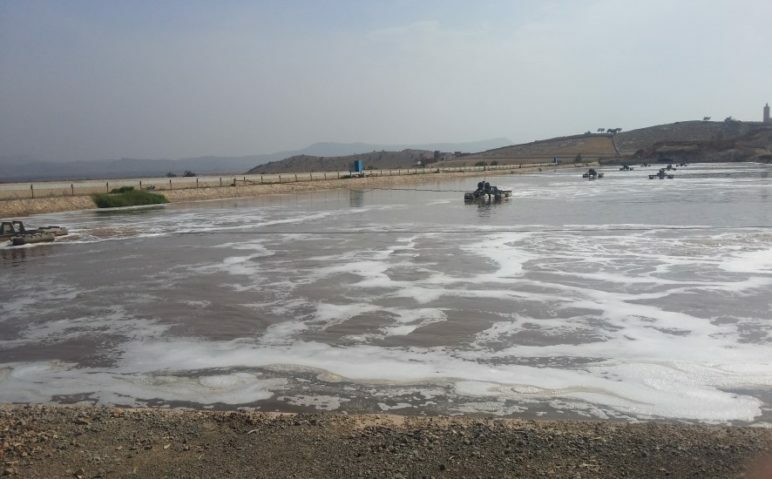 The wastewater plant is operating efficiently with the Aire-O2 Tritons and sludge does not build up in the aeration basin; saving the plant time and money. Impact: Salah Nahid, Director of Sucrafor, is very satisfied with Aire-O2 Triton’s performance. The plant is now able to handle the increased load without further investment into the wastewater plant, providing significant savings to the company. Maintenance has also been simplified, especially at end of the harvest season. Nahid and his team are confident in the equipment and know the equipment will be ready to work during spring start-up, as Sucrafor prepares for future successful harvests. Solutions Providers: Questions on how we can help solve challenges you’re facing? Contact us at +1-952-448-6789 for more information. Together, we can create innovative solutions for your wastewater challenges.